Actinidic beach sands have been postulated to play a pivotal role in abiogenesis. Chronic calcific pancreatitis (CCP), endomyocardial fibrosis (EMF), multinodular goitre (MNG) and mucoid angiopathy along with the root wilt disease of coconut is endemic to Kerala with its radioactive actinide beach sands. The Actinides like rutile producing intracellular magnesium deficiency due to actinide-magnesium exchange sites in the cell membrane has been implicated in the etiology of EMF. Endogenous digoxin, a steroidal glycoside which functions as a membrane sodium-potassium ATPase inhibitor has also been related to its etiology of EMF, CCP, MNG and mucoid angiopathy. Digoxin produces intracellular magnesium deficiency which results in acidic mucopolysaccharide accumulation of the vascular, cardiac and endocrine tissues contributing to the pathogenesis. Organisms like phytoplasmas and viroids have also been demonstrated to play a role in the etiology of root wilt disease of coconut which is co-endemic in Kerala. The possibility of endogenous digoxin synthesis by actinide based primitive organism like archaea with a mevalonate pathway and cholesterol catabolism was considered. The role of RNA viroids in the etiopathogenesis of EMF, CCP, MNG and mucoid angiopathy was also explored. Davies has put forward the concept of a shadow biosphere of organisms with alternate biochemistry present in earth itself10. An actinide dependent shadow biosphere of archaea and viroids in the above mentioned disease states is described. The group of diseases are seen in particular geographic areas of the world near the equator- South India, South America, South Africa and Australia. These geographic areas are rich in placer deposits containing monazite, illmenite, rutile and thorium. These areas peninsular India, Africa, Australia, south America and Antartica formed part of one single pre-historic continent in Southern ocean and Indian ocean called Lemuria by geologists. The evolution of primates and homo sapiens occurred in the rift valley of Africa part of this pre-historic continent. Metal actinides in beach sands have been postulated to play a role in abiogenesis. Actinide mineral like rutile, monazite and illmenite by surface metabolism would have contributed to abiogenesis. A hypothesis of cholesterol as the primal prebiotic molecule synthesised on actinide surfaces with all other biomolecules arising from it and a self replicating cholesterol lipid organism as the initial life form is presented. Actinide dependent organism would have contributed to primate and human evolution. 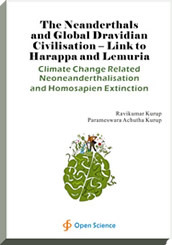 It is also possible that actinidic organisms would also have contributed to the destruction of the Lemurian supercontinent. This paper postulates that the co-existence of EMF, CCP and MNG in the above mentioned geographic areas points to the possibility of these land masses being joined together has one single land mass- Lemuria. The postulated Lemurian part of the Indian sub-continent in South India is inhabited by the dominant Nair community which has a high incidence of EMF, CCP and MNG. The dominant Nair community also has a high incidence of autism. Neanderthal anthropometric features have been described in autism. Neanderthal metabolonomics have also been described in autism. The same anthropometric features are seen in EMF, CCP and MNG. It is possible that homo neanderthalis would have originated in the super continent which occupied the southern ocean. The island of Sumatra is home to another human species homo floresiensis which lived along with homo neanderthalis. This suggests an oceanic origin of homo neanderthalis in the supercontinent in the southern ocean. Recurrent Tsunamis would have forced the migration of homo neanderthalis to the Eurasian land mass especially to Harappa, Sumeria, Etruscia, Egypt and Basque country. There is a high incidence of Neanderthal genes in the Basque population. The language spoken in Harappa, Sumeria, Etruscia, Egypt and Basque country had a Dravidian sub-stratum. The population in these areas are matrilineal and female dominant. This suggests an out of oceania hypothesis for the origin of homo neanderthalis. The climate change and global warming can lead to symbiotic archaeal growth and neanderthalisation of homo sapiens leading to their extinction. The hypothesis is discussed in this book. MD, DM, MNAMS, specialized in Molecular Medicine and Neurology. He works as Professor of Molecular Medicine and Neurology at the Metabolic Disorders Research Center, Trivandrum, Kerala. He is also the Professor of Internal Medicine, Medical College, Trivandrum. His research interest includes biology of disease and consciousness. Neurologists, philosophy, anthropologists and general scientific reading public.